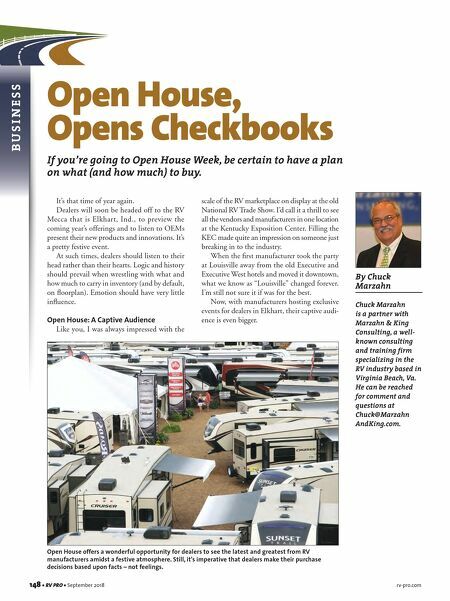 148 • RV PRO • September 2018 rv-pro.com B U S I N E S S Open House, Opens Checkbooks If you're going to Open House Week, be certain to have a plan on what (and how much) to buy. It's that time of year again. Dealers will soon be headed off to the RV Mecca that is Elkhart, Ind., to preview the coming year's offerings and to listen to OEMs present their new products and innovations. It's a pretty festive event. At such times, dealers should listen to their head rather than their hearts. Logic and history should prevail when wrestling with what and how much to carry in inventory (and by default, on floorplan). Emotion should have very little influence. Open House: A Captive Audience Like you, I was always impressed with the scale of the RV marketplace on display at the old National RV Trade Show. I'd call it a thrill to see all the vendors and manufacturers in one location at the Kentucky Exposition Center. Filling the KEC made quite an impression on someone just breaking in to the industry. When the first manufacturer took the party at Louisville away from the old Executive and Executive West hotels and moved it downtown, what we know as "Louisville" changed forever. I'm still not sure it if was for the best. Now, with manufacturers hosting exclusive events for dealers in Elkhart, their captive audi- ence is even bigger. Open House offers a wonderful opportunity for dealers to see the latest and greatest from RV manufacturers amidst a festive atmosphere. Still, it's imperative that dealers make their purchase decisions based upon facts – not feelings. 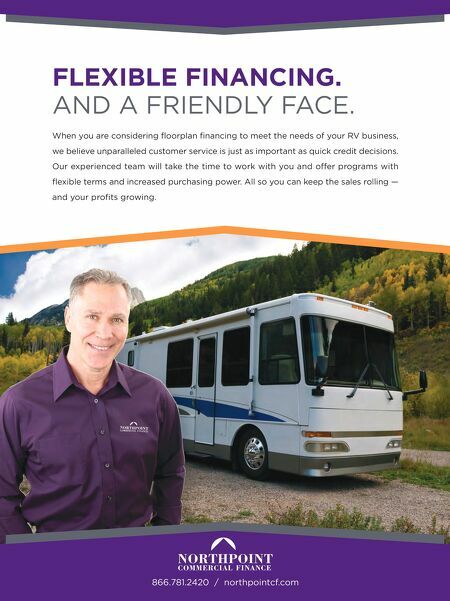 By Chuck Marzahn Chuck Marzahn is a partner with Marzahn & King Consulting, a well- known consulting and training firm specializing in the RV industry based in Virginia Beach, Va. He can be reached for comment and questions at Chuck@Marzahn AndKing.com.